A tough looking truck sloshing through puddles, hauling hay, and driving over dirt roads in a vast landscape. That’s pretty much 67% of every truck commercial ever made from the present day all the way back to the dawn of television. It is the visual that the companies want their buyers to connect with. Strength, toughness, and rugged individualism. 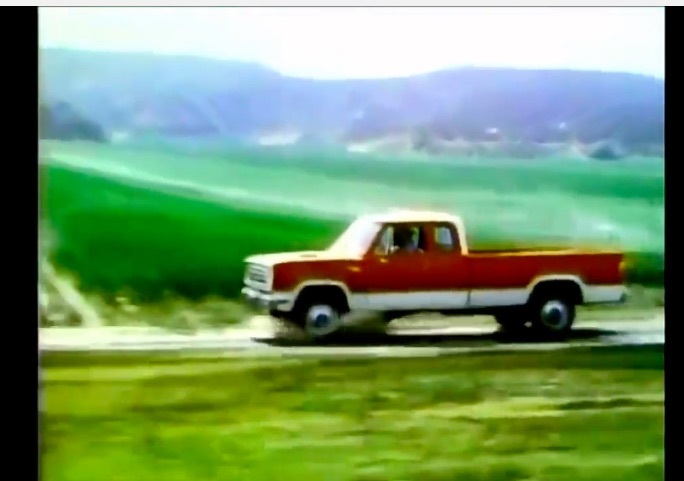 In the case of this Dodge ad they talk about the “Man who’d rather drive a truck than a car.” That’s putting it in more blunt terms than most advertisers do but it is the same message. They mention four wheel drive and some of the other available options but this is not an ad that touts the individual specs of the truck as much as it touts the idea of owning the truck and buying what you want. Not one of those weakling cars, one of these tough trucks! We’re fans of the 1970s Dodge trucks because while their styling stayed pretty much the same for a very, very long time they are good looking and simple machines. The particular model shown in the ad is really handsome with a two tone paint job, the stance of a four wheel drive, and a luxurious extended cab. The “rancher” driving the truck is the man! Take trip back 40 years to see how much (or how little) truck salesmanship has changed over the decades. Ever See A Mining Haul Truck Bounce? If You Watch This Loading Fail Video You Will Cold Shouldered: The Not-So-Pretty Side Of The Zell am See Ice Race!